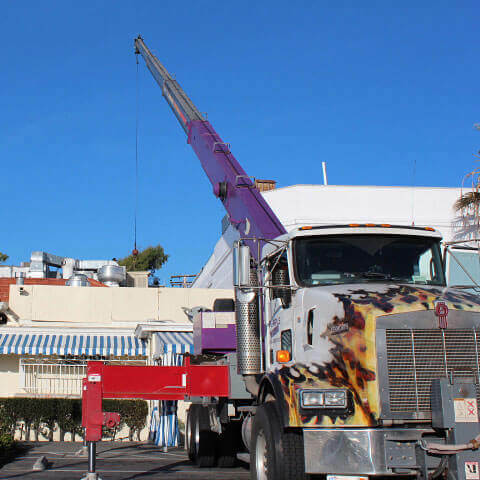 At Purple Crane, we've been performing expert, affordable HVAC unit lifting and removal for thirty years, providing reliable crane service for thousands of HVAC removal and installation jobs throughout Southern California. Our experienced, licensed, and CCO-certified crane operators complete all lifts safely, efficiently, and accurately. We also offer very competitive rates, and our efficient service helps minimize project costs. We have the experience and expertise necessary to ask the right questions and determine the correct crane for your air conditioner removal or installation project. You'll get the right crane the first time, every time, which helps control the both the cost and timeline of your project. We also guarantee that our cranes and operators will arrive on time, helping you stay on schedule. We specialize in both light- and heavy-duty lifts for air conditioners: our state of the art cranes range from 3-ton to 75-ton capacity, and they can perform 75- to 165-foot lifts. That means we can lift any AC unit, from the smallest to the largest, at almost any location. We've lifted units from rooftops, side yards, backyards, even over houses and buildings. If you're replacing an air conditioning unit, we can perform the lift for both the removal of the old unit and installation of the new (while we cover all the lifting services, you will need a certified HVAC contractor to perform the actual removal and installation). We even offer transportation service for HVAC units, including free haulaway to a certified recycler of your old air conditioner. Call today to learn more about our expert services and affordable rates for commercial and residential crane rental in Southern California, and find out how Purple Crane can help you with your air conditioner removal or installation. We have a live operator ready to assist you 24 hours a day, 7 days a week. Our family-owned business is OSHA compliant and fully insured, and we can get same day insurance certificates whenever needed.